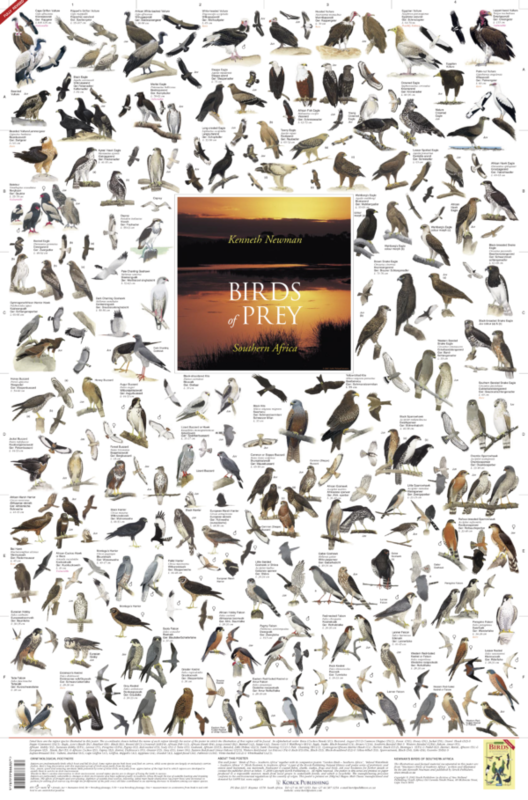 This wall poster shows 68 species of Southern African Birds of Prey illustrated by Kenneth Newman. While this group of birds is majestic and compelling, all is not well with them. Raptors or birds of prey are predominantly birds which hunt and kill for food. Some raptor species both hunt and feed on carrion, while some species are largely or exclusively carrion feeders. Man’s long fascination with this important group of birds stems partly from the sheer size, power, speed and amazing aerobatic skills possessed by some of these birds, and partly from appreciation of the high level to which raptors are developed to enable them to survive in their environment. Thanks to Man’s careless intervention in their environment, several raptor species are in danger of losing the battle to survive. Raptors are particularly vulnerable to changes in their environment and have suffered greatly in southern Africa through the loss of suitable hunting and breeding habitats. The effects of droughts, and over-grazing, depletion of suitable food sources, poisoning, lethal man-made obstructions (eg power lines) and increased competition for existing food sources (eg. through the proliferation of the pied crow) all have contributed to an alarming decrease in numbers among our raptor species. Illustrated on this poster are all l68 birds of prey. Among the raptor families represented on this poster are: buzzard, eagle, snake eagle, falcon, goshawk, harrier, marsh harrier, hawk, hobby, kestrel, kite, sparrowhawk & vulture. Easy co-ordinates and an alphabetical species list allow you to quickly locate the bird you are looking for on the poster. Bird names are listed in English, Afrikaans, German & Latin. Whether you are a serious bird watcher or not, one thing is guaranteed … this poster will fascinate you. “Birds of Prey – Southern Africa” (Fully Revised) is one of 36 beautifully illustrated Natural History posters produced by Korck Publishing. This poster will adorn any wall at home, in the waiting room, at the office or in school or university. It will make a perfect gift not just for bird enthusiasts but nature lovers in general. The wall poster measures 900 mm x 594 mm (35.4 x 23.4 inches). The poster is double laminated (ie laminated both sides) for ultimate protection , and will be shipped to you in a sturdy postal tube. Many of our customers throughout the world choose to frame or blockmount the poster such is the quality and impact of the poster itself.